“It’s too hot.” “I don’t want to go to Grandma’s house.” “These peas are gross.” Listening to constant complaints from your child will wear on your patience. Complaining isn't good for your child either. If he's always focused on the negative, he'll be at a higher risk of mental health problems, like depression and anxiety. He'll also be more likely to encounter social problems. His peers won't want to spend time with a kid who constantly complains. If your child complains about everything or whines regularly, help him learn to be more positive. If you don't curb the negativity and unhealthy social habits while he’s young, he may grow up to become an adult who constantly complains. Although you might be tempted to say something your parents probably told you, like, “Quit crying or I’ll give you something to cry about, minimizing your child's feelings isn't helpful. Sometimes kids complain because they want you to know that they’re dealing with some difficult feelings or some physical discomfort. 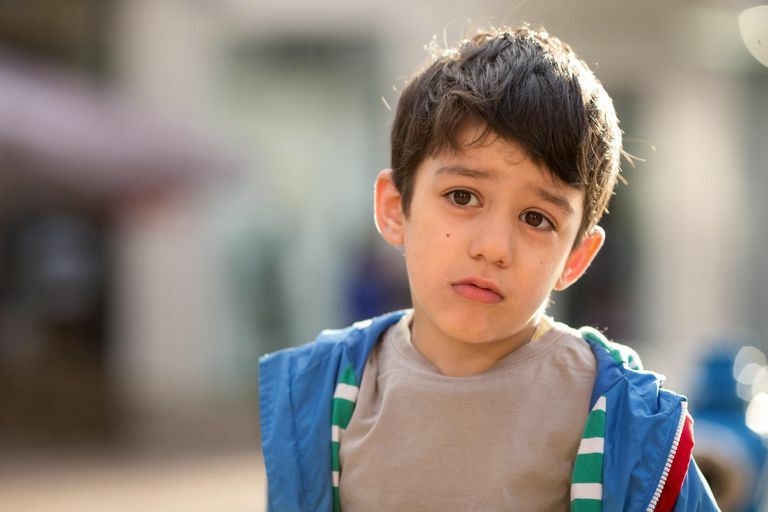 Validating your child's discomfort may be enough to settle him down. Show a little empathy and make it clear that dealing with discomfort is part of life. If your child's behavior requires further intervention, discipline the behavior, not the emotion. Say something like, "You're going to go to time-out now because you threw your toy. It's OK to feel frustrated but it's not OK to throw things." If there are further protests or your child begins whining, ignore it. Make it clear that you aren’t going to pay attention to negative attempts to get attention. If he needs help thinking of options, remind him he could sit in the shade or ask for help getting a cold drink. Teaching your child problem-solving skills can help him see that coming to you and complaining isn’t likely to fix the problem. But, he can ask for help solving the problem or he can figure out how to solve the problem on his own if it’s age appropriate to do so. When kids improve upon their problem-solving skills, they will be less likely to complain. Instead, they'll take action that improves their situation. Be cautious about rescuing your child when he's struggling with frustration or when he's having a hard time. If you jump in and solve every problem for him he may develop a sense of learned helplessness where he assumes other people have to solve problems on his behalf. If your child is always quick to point out the negative in any situation, point out the positive. This can help your child develop a more balanced view of the world instead of only seeing the bad. If he says, "I hate that we had to leave the park early because it rained." You might respond by saying, "That can be frustrating when that happens. But I'm happy we got to to go to the park and play for a while before the rain started." Don't let your child stay stuck in a victim mentality. If he thinks he's constantly a victim of bad circumstances and mean people, he won't take any action to fix the situation. Help him focus on the things he can control. If he's complaining that he can't ride his bike because it's raining, talk about the indoor activities he could do to have fun. Say something like, "I know you're disappointed you can't ride your bike. But what are some fun indoor things you could do instead?" Sometimes, an overly negative attitude can signal an underlying mental health issue. Children with depression, for example, often dwell on the negative and children with anxiety often imagine worst-case scenarios. If you suspect your child’s constant complaining could be a sign of something more serious, speak with your child’s pediatrician. Webster-Stratton C.The Incredible Years: Parents, Teachers, and Childrens Training Series: Program Content, Methods, Research and Dissemination 1980-2011. Seattle, WA: Incredible Years; 2011. Morin A.13 Things Mentally Strong Parents Don't Do: Raising Self-Assured Children and Training Their Brains for a Life of Happiness, Meaning, and Success. New York, NY: William Morrow, an imprint of HarperCollins Publishers; 2017.